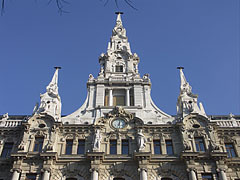 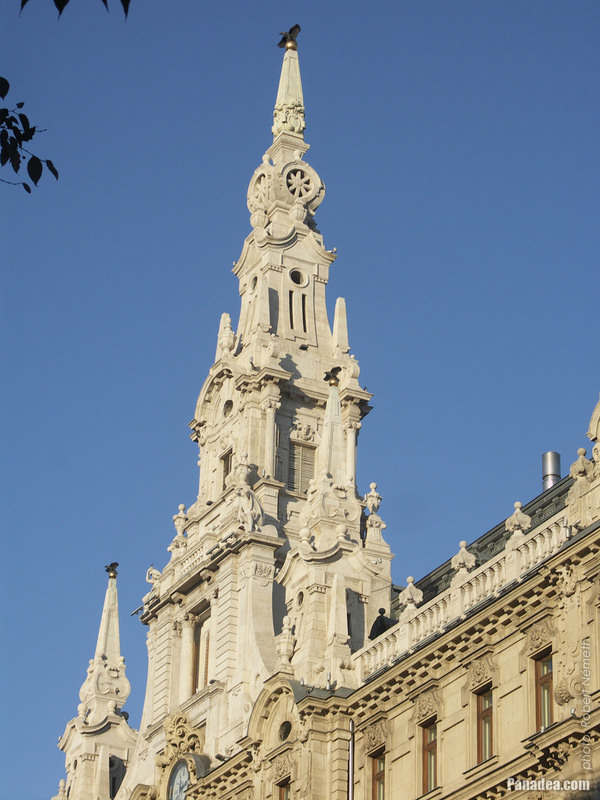 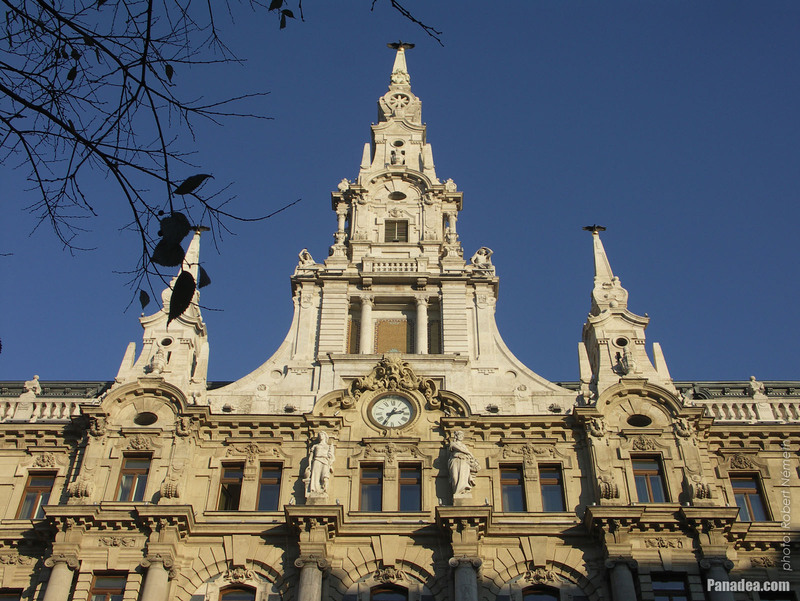 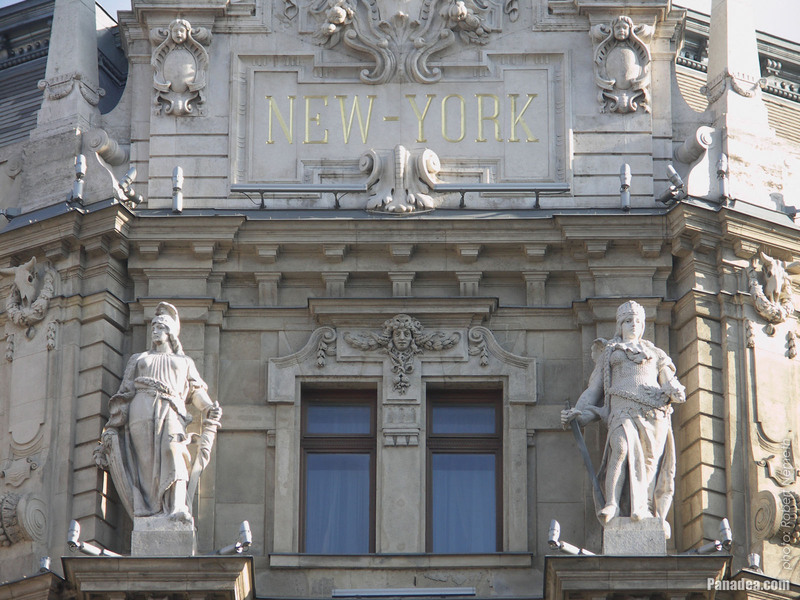 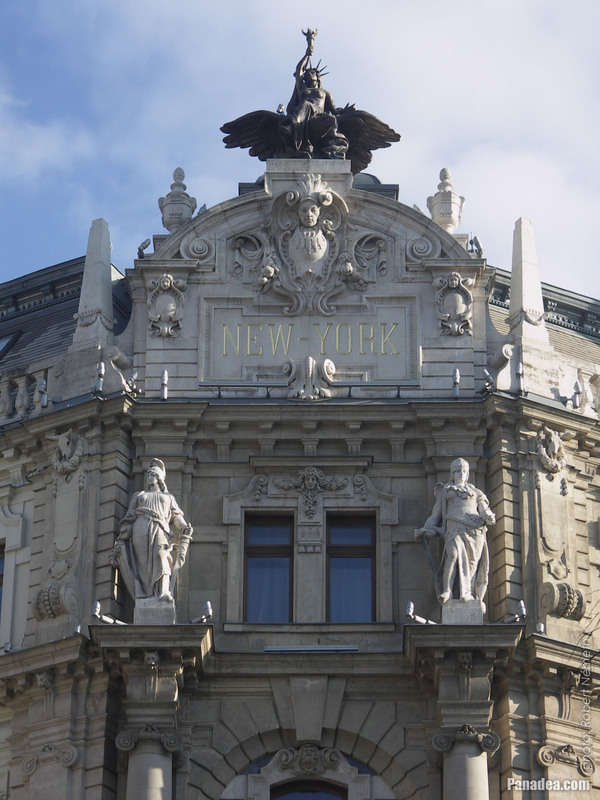 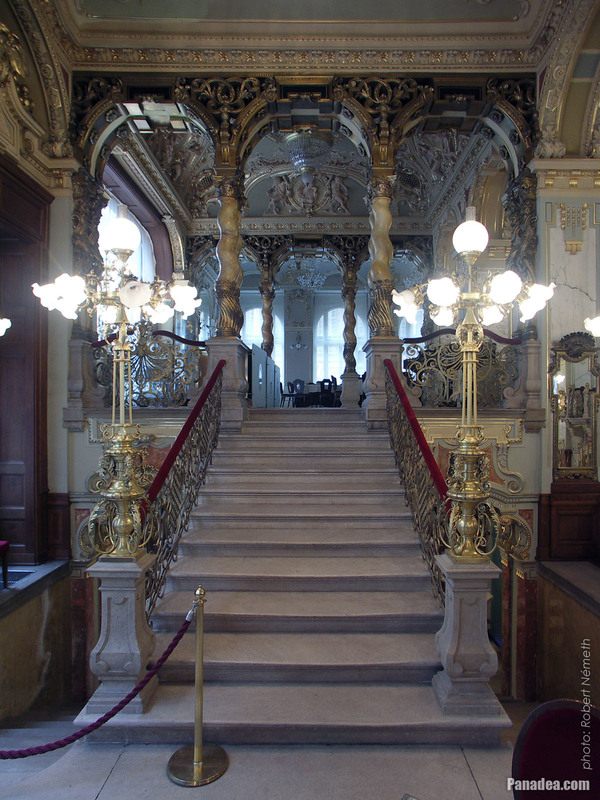 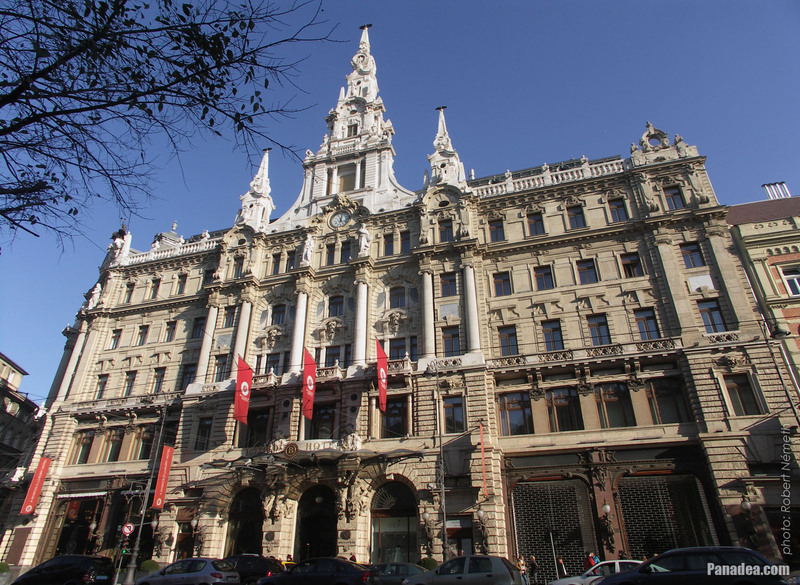 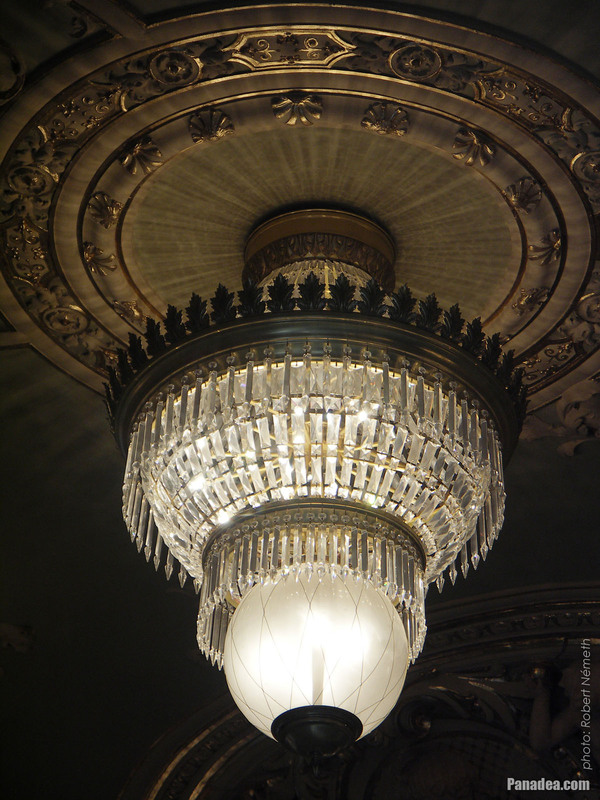 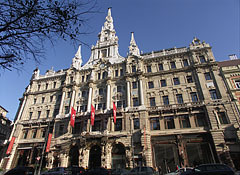 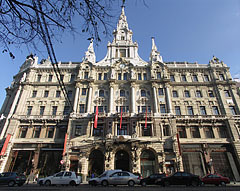 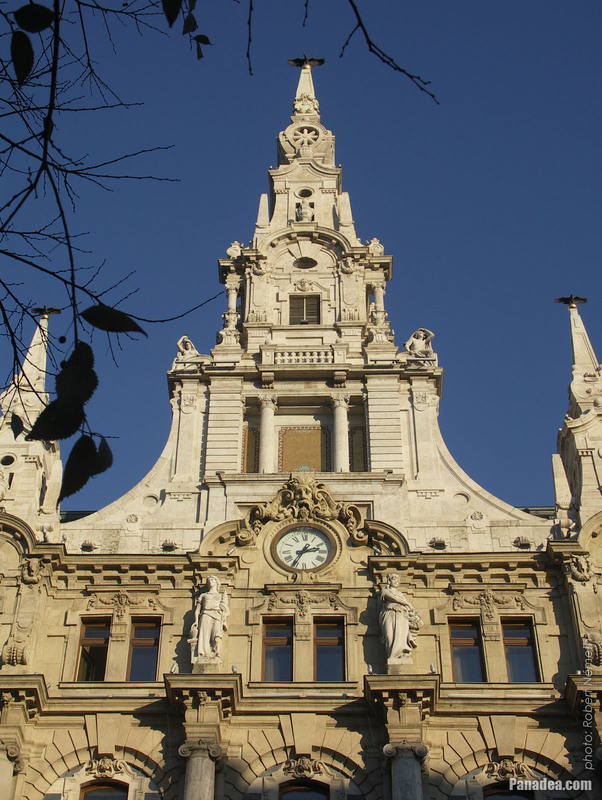 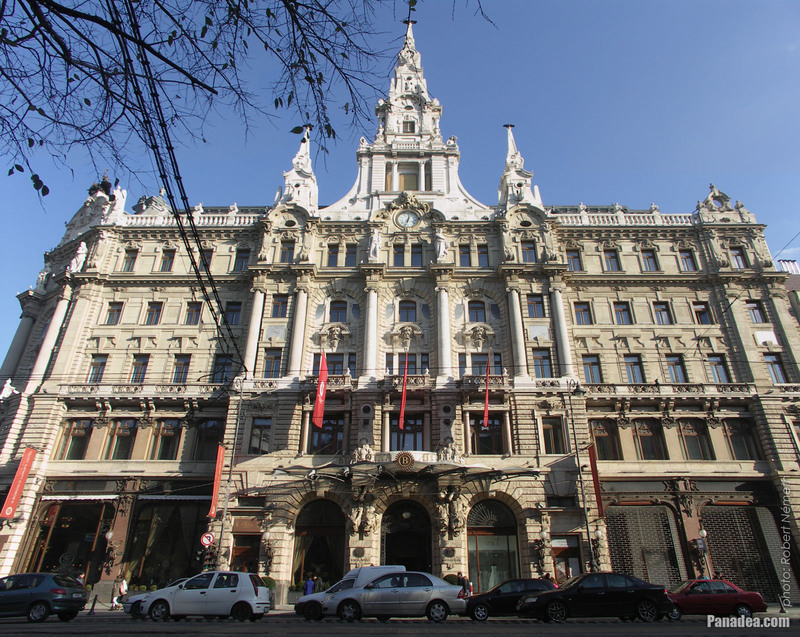 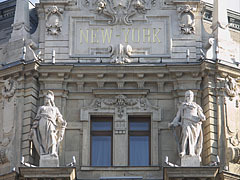 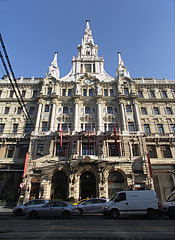 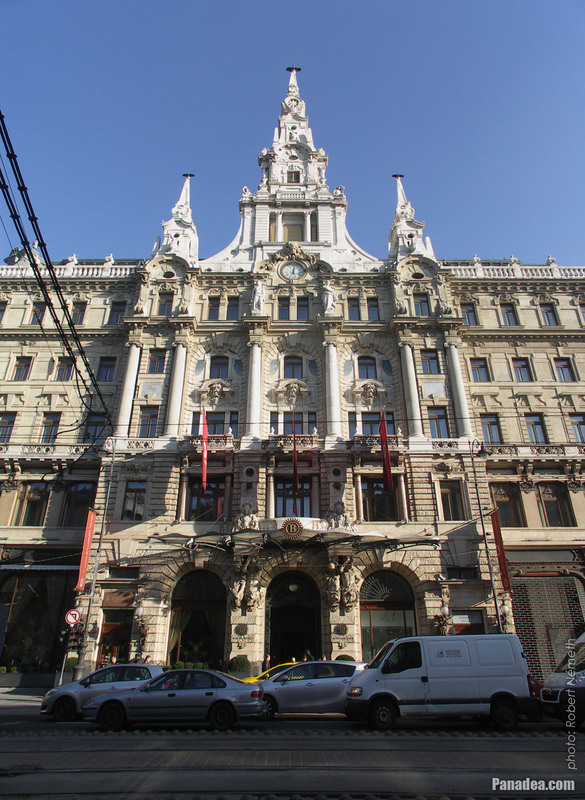 The palace was built in 1894 for the American New York Life Insurance Company (so that's why it is called New York Palace), architects: Alajos Hauszmann, Flóris Korb and Kálmán Giergl. 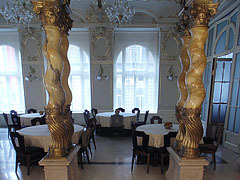 Initially this premise was furnished as a billiard room. 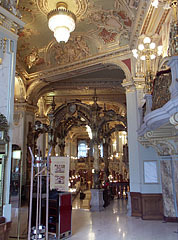 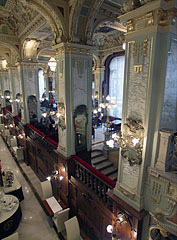 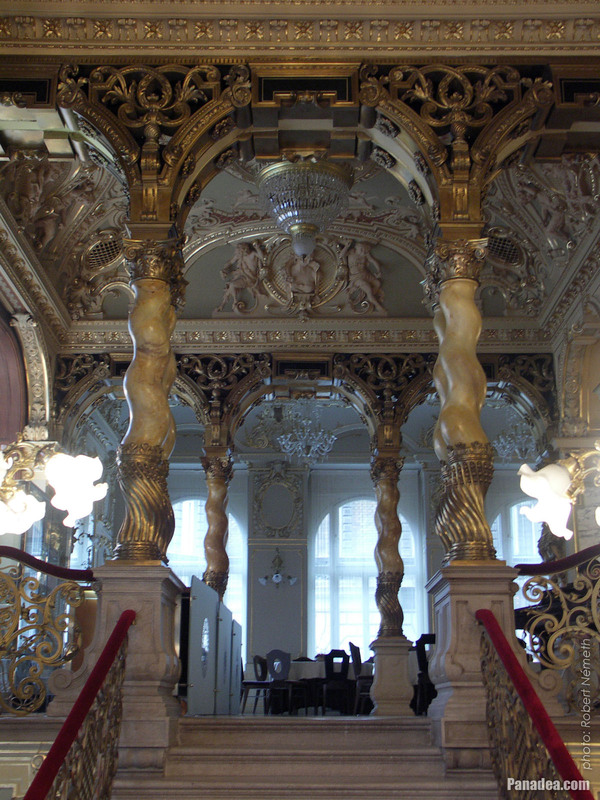 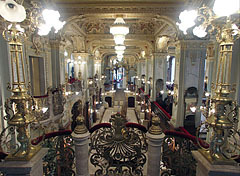 After it was opened in 1894 the restaurant soon became a cultural meeting place, "literary café", a haunt of artists, journalists and criticists, actually the cream of the literary and art world. 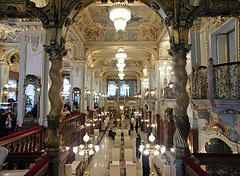 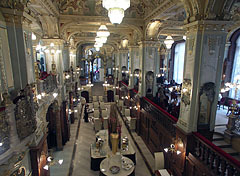 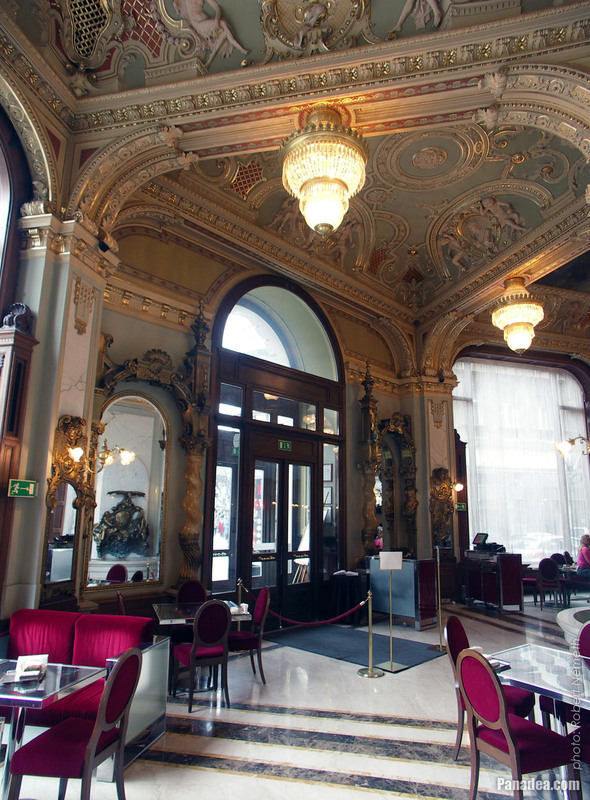 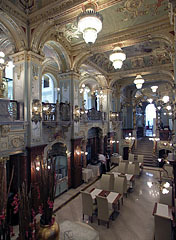 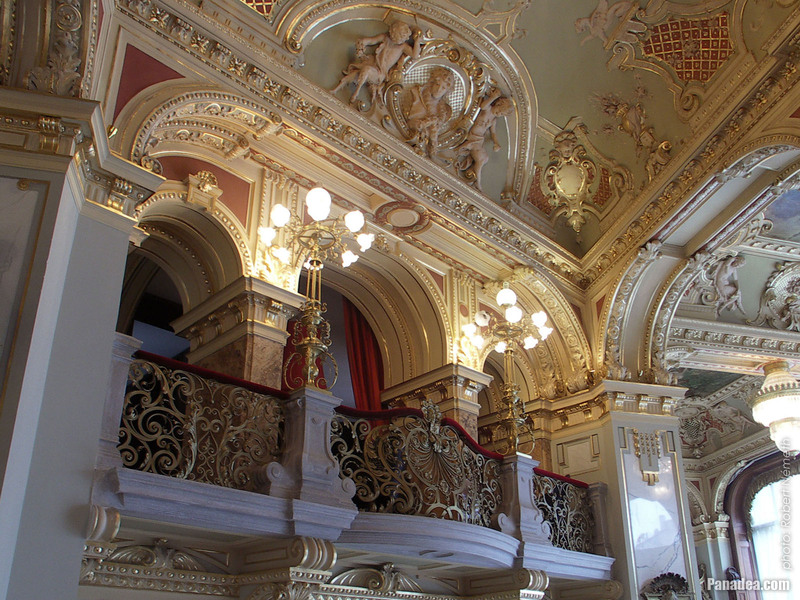 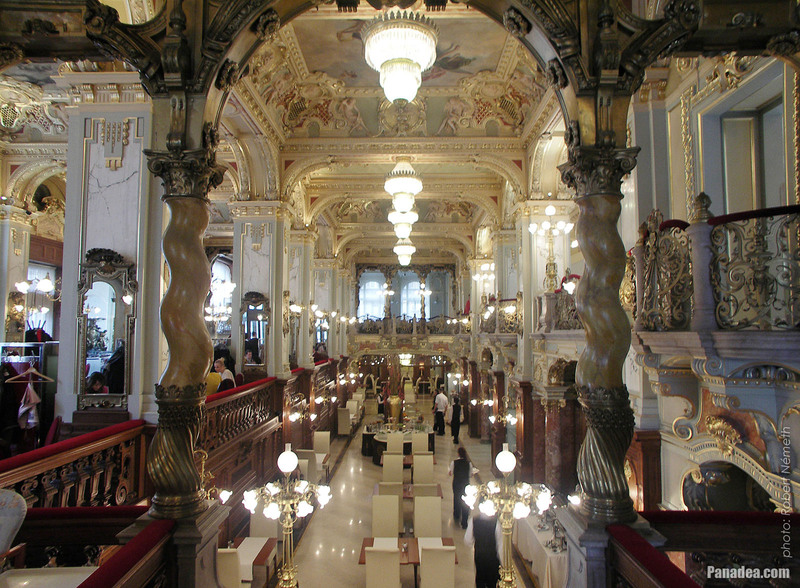 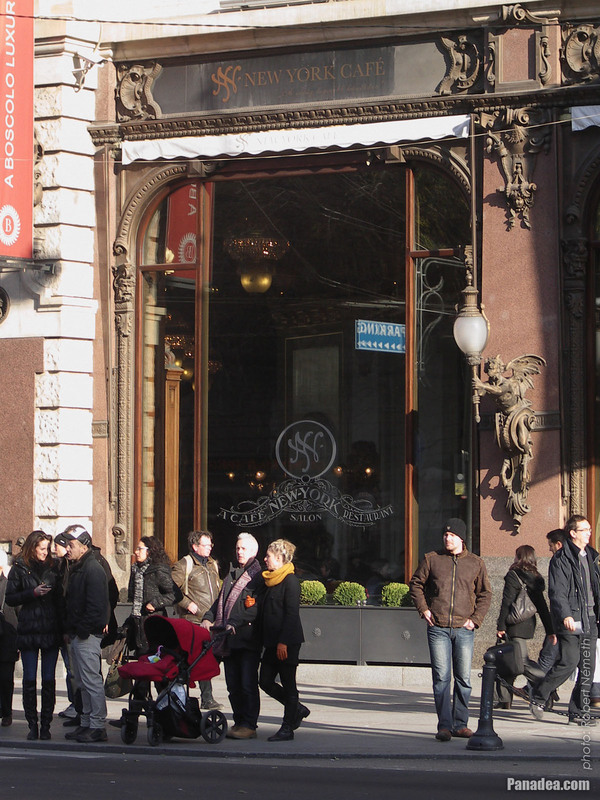 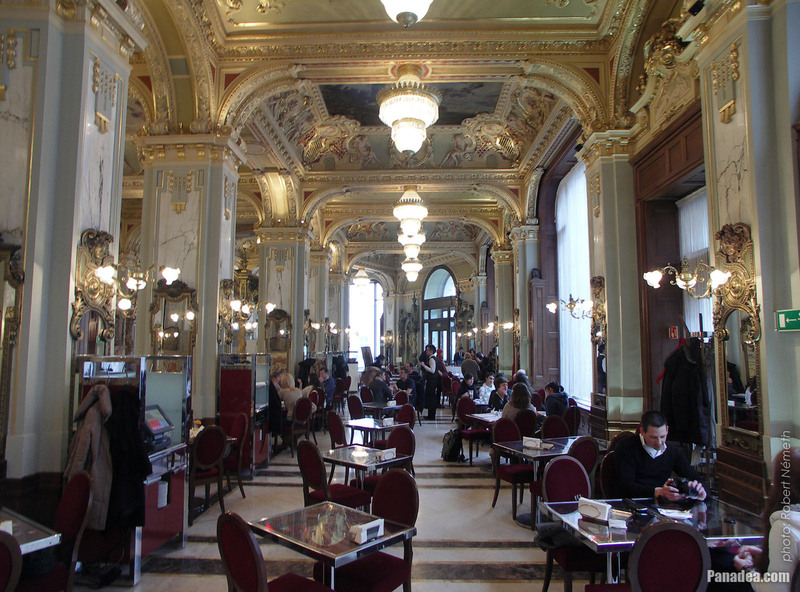 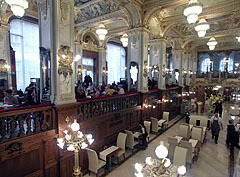 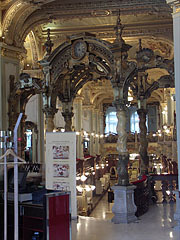 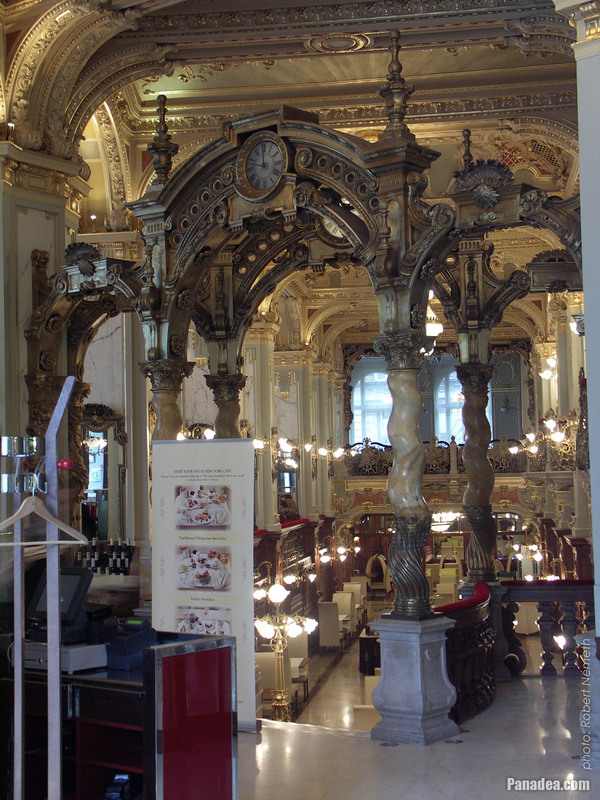 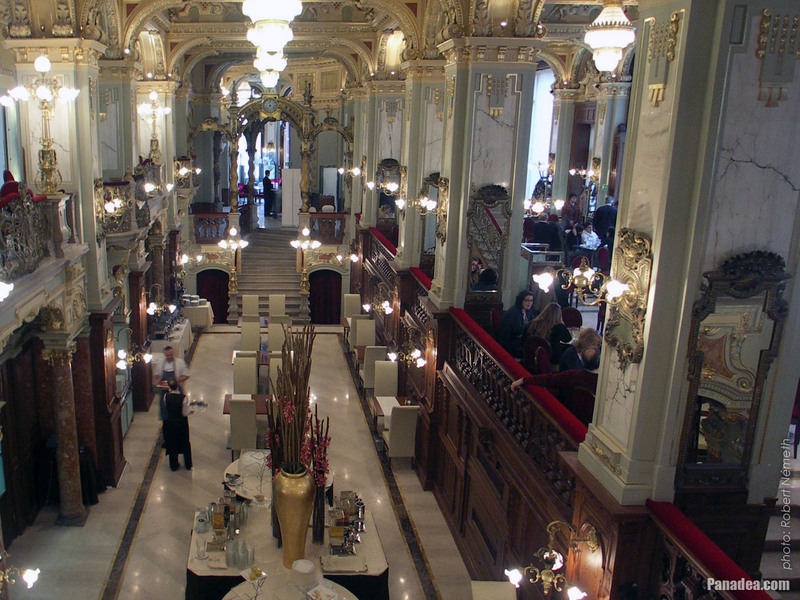 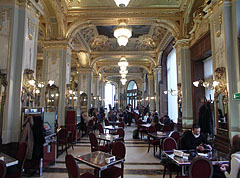 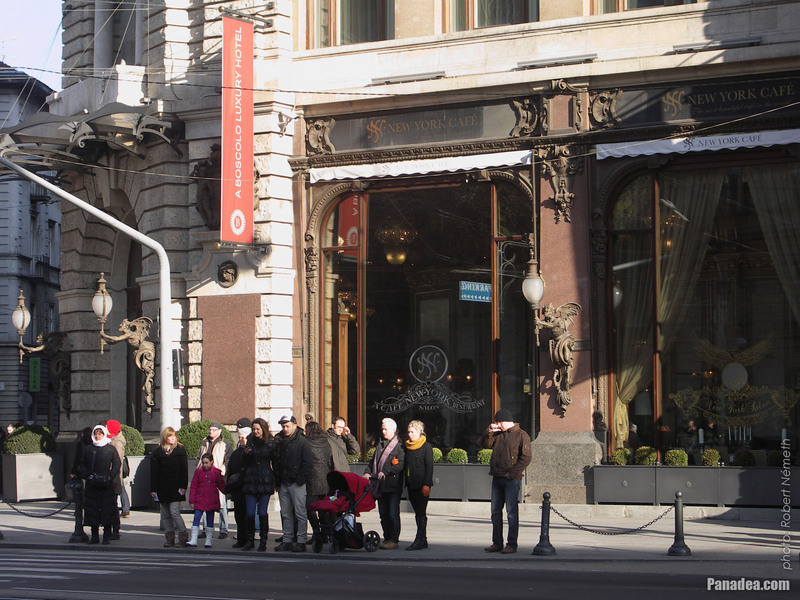 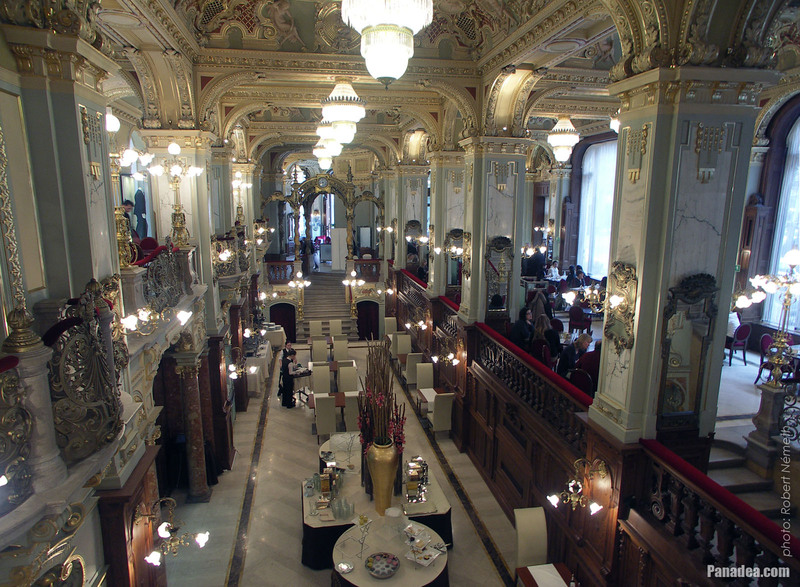 In 2011 and 2013 this café was chosen by the professionals of the "U City Guides" online guidebook as the most beautiful coffee house in the world. 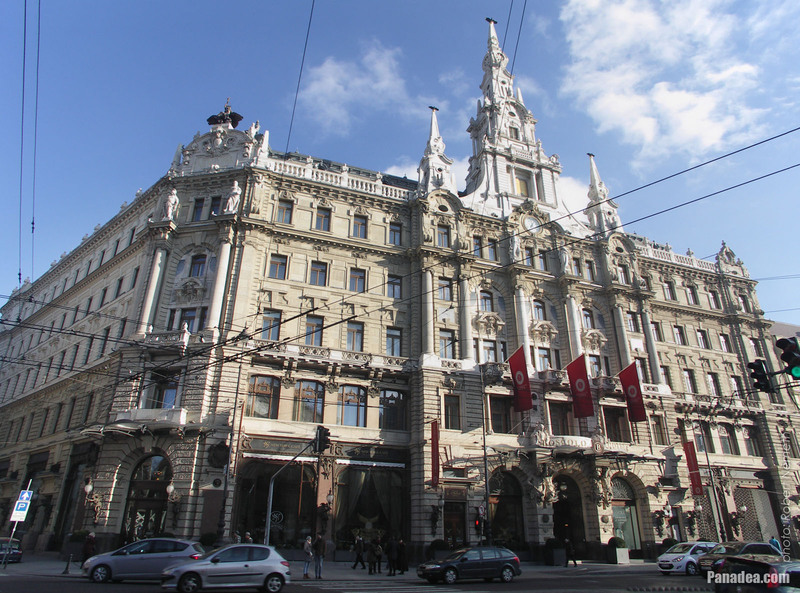 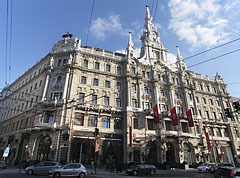 After the World War II the great great social life here ceased to exist, regardless of in 1954 it was opened again for a while under the name of Hungária Kávéház ("Hungária Café"). 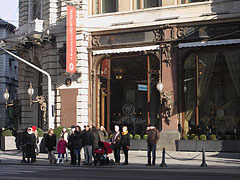 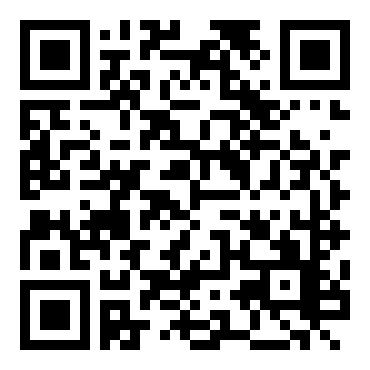 However, in 2013 the so-called "New York Művész Páholy" artists' gathering and cultural event series was established, openly also in order to pay the artists attention to discover the New York Café again. 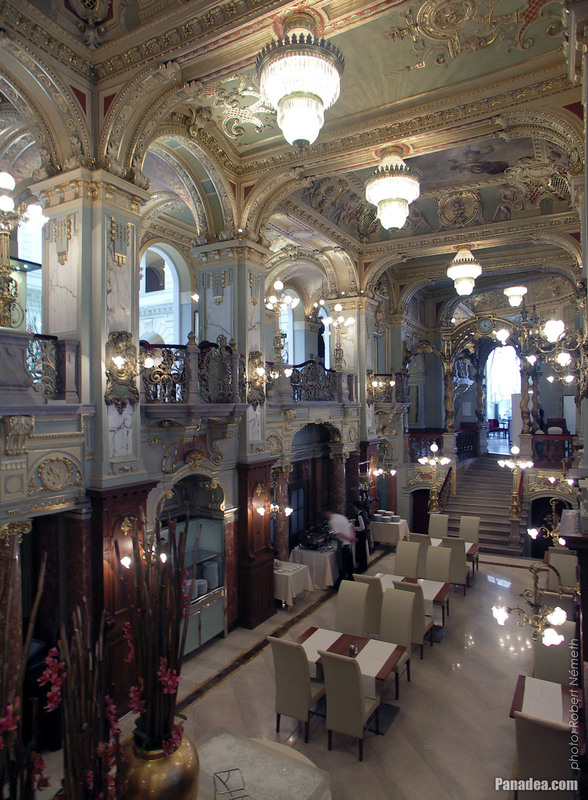 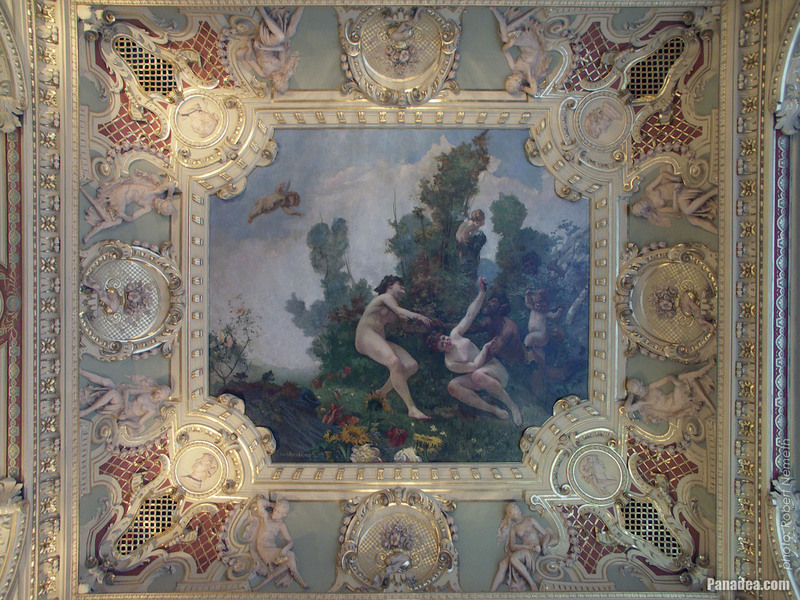 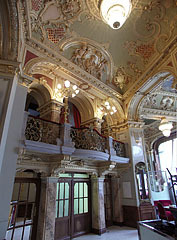 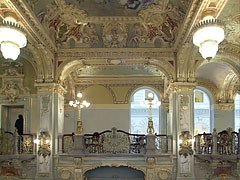 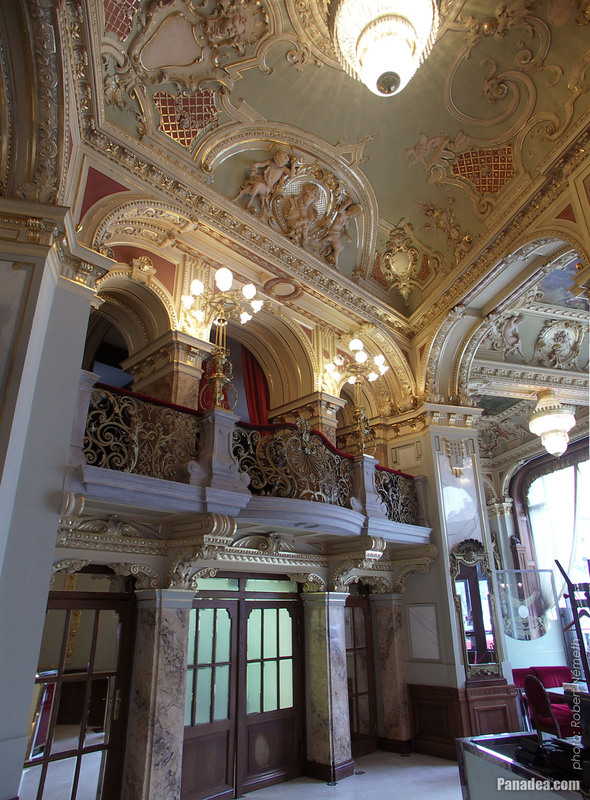 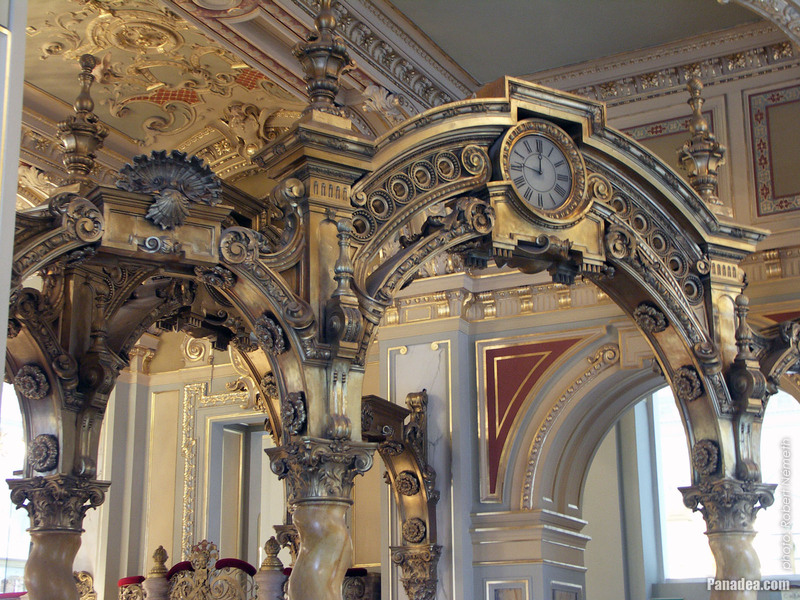 The wall paintings within the coffee house were created by Gusztáv Mannheimer and Ferenc Eisenhut. 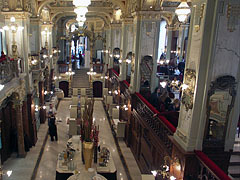 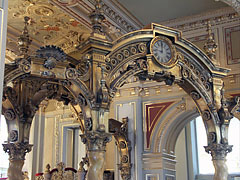 The wall lamps near the shop-windows of the coffee house with the bronze consoles representing winged faun figures are created by Károly Senyei Hungarian sculptor (there are a total of fourteen of them on the downstairs facade of the building). 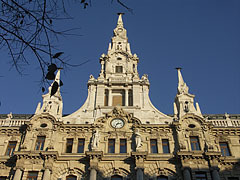 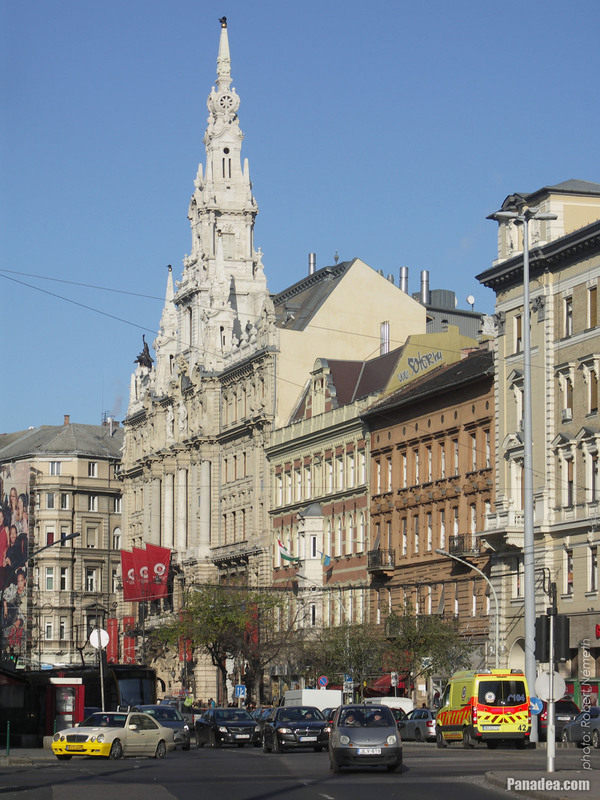 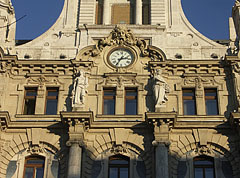 On 4 Ferbuary 1903 the roof of the monumental apartment building was destroyed in a great fire. 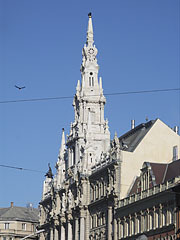 However, the reconstruction was completed quite soon, in the summer of the same year. 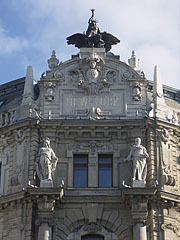 The building was built in 1884 and renovated in 2006. 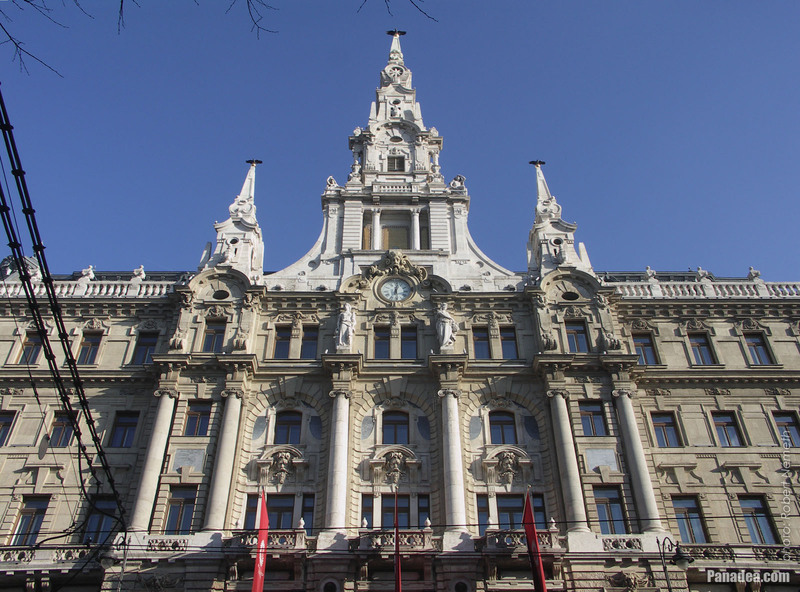 The reconstruction work was awarded by the European Union with the Europa Nostra Award, the prize for architectural and cultural heritage. 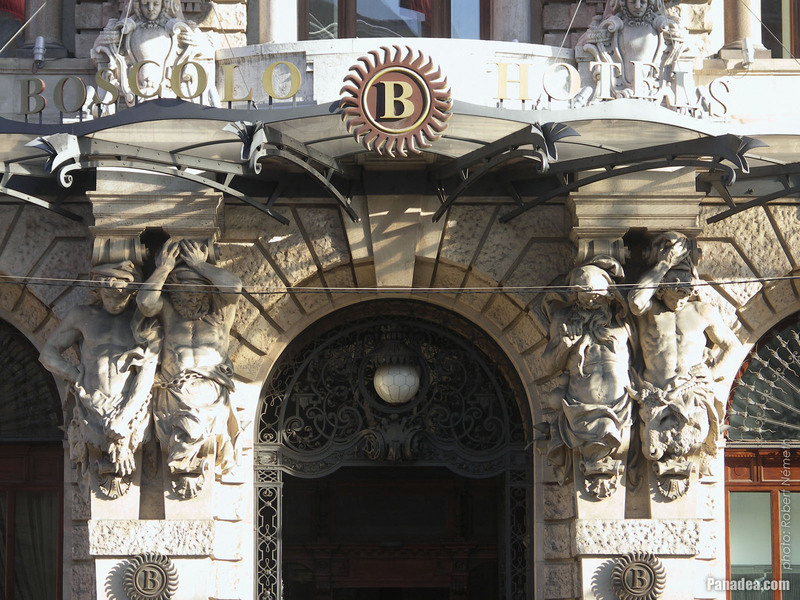 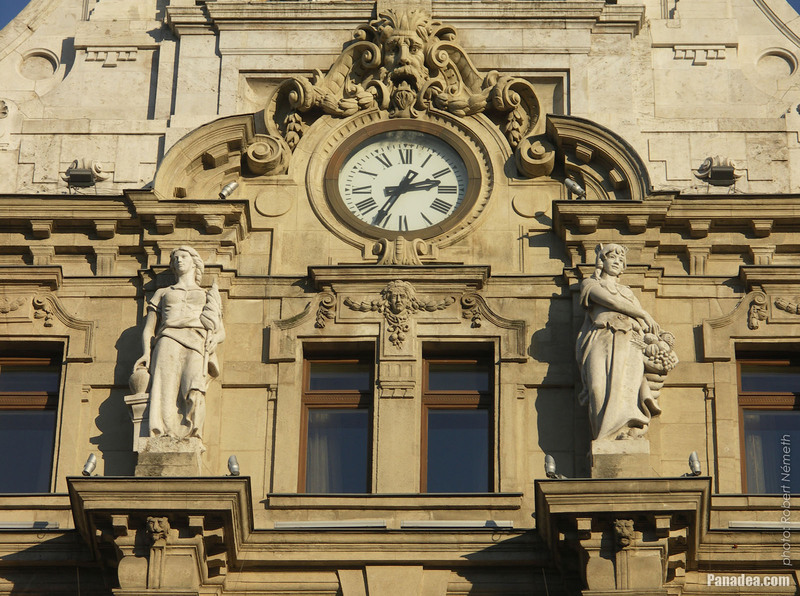 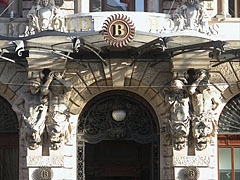 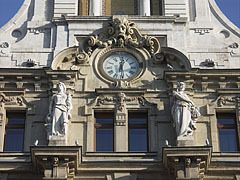 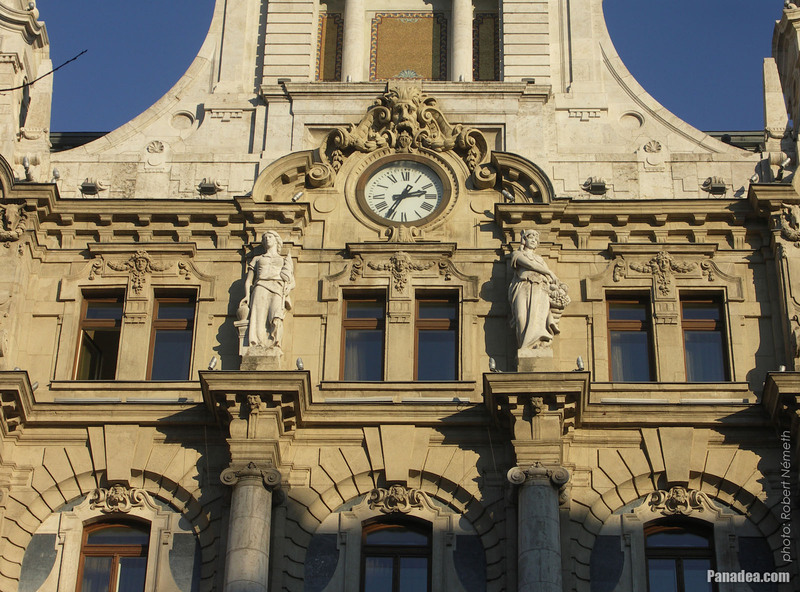 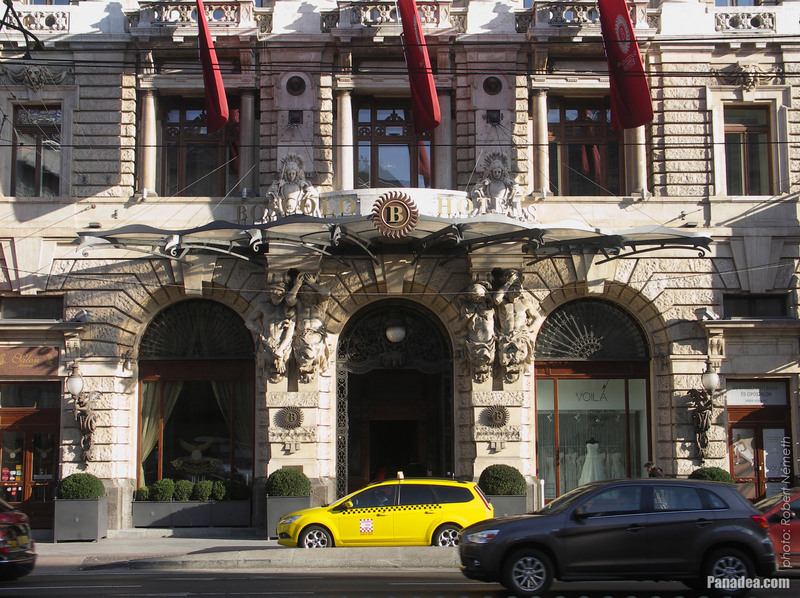 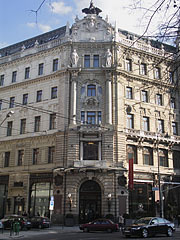 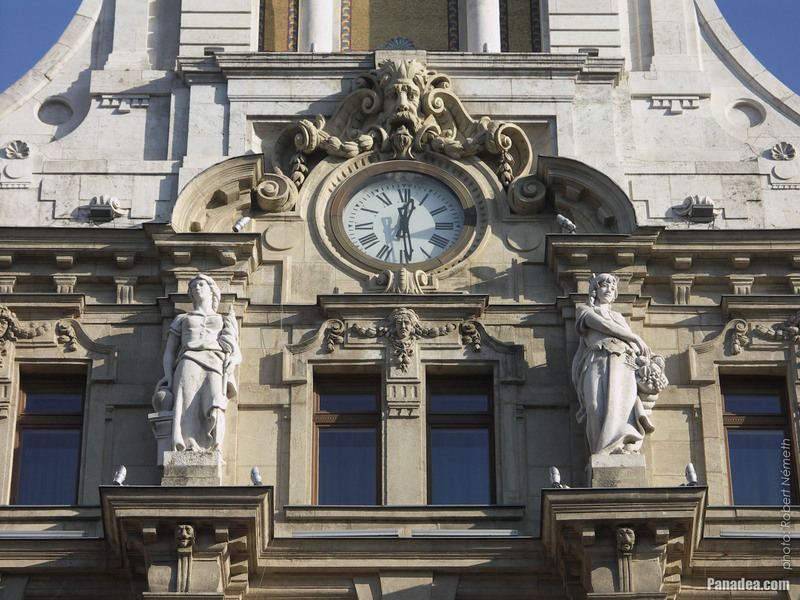 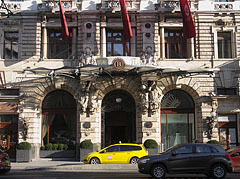 The building was purchased by the Italian Hotel Boscolo Group in 2001. 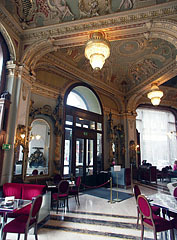 The owner had the building completely renovated in 2006, both the hotel and the old coffee house were opened at that time. 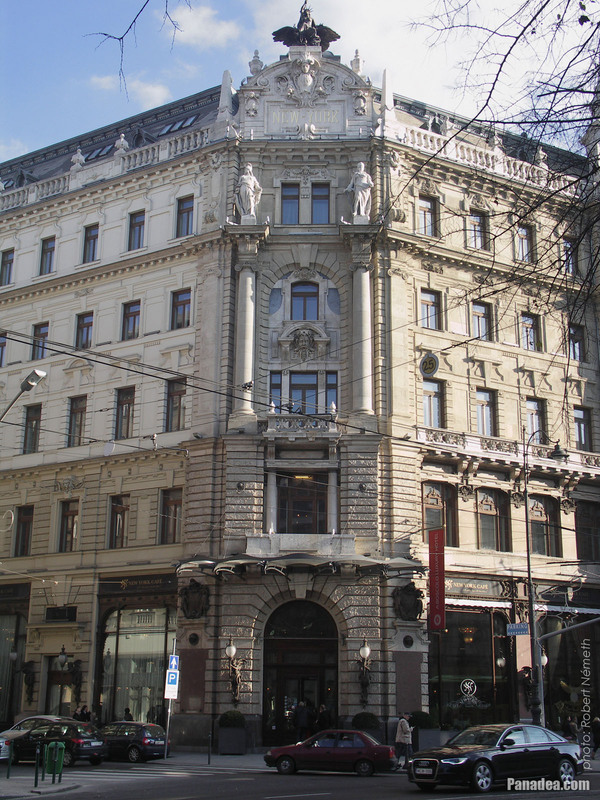 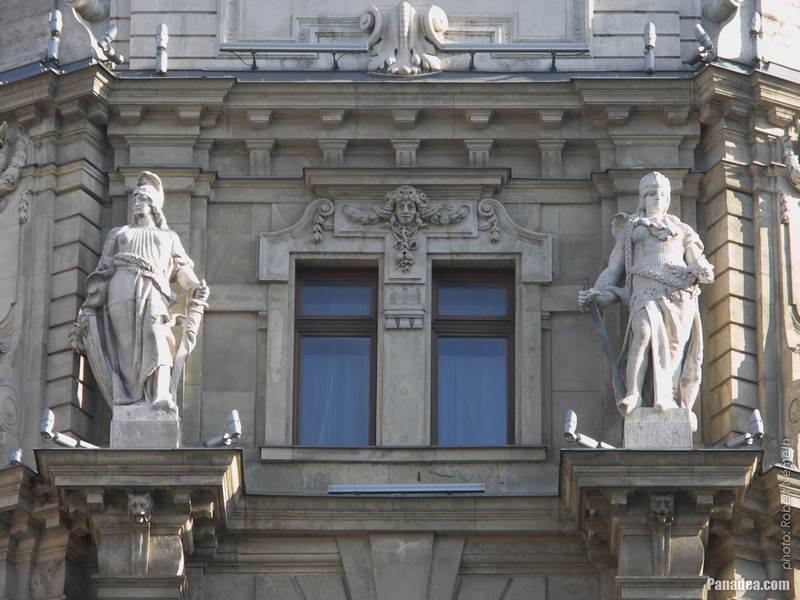 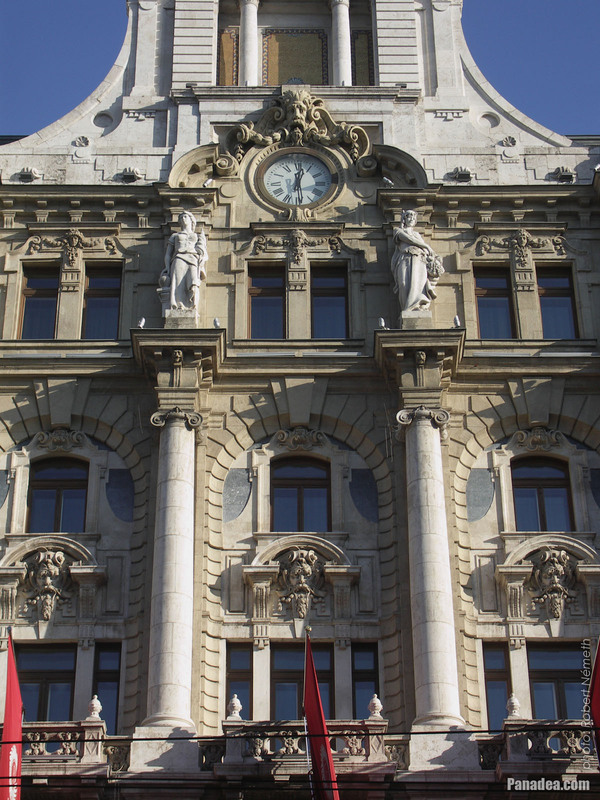 These were co-created by Károly Senyei and Miklós Köllő, but the original sculptures including the "Thriftiness" and "Richness" allegorical figure statues were destroyed in the Hungarian Revolution of 1956. 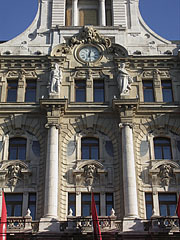 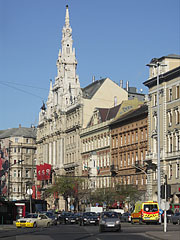 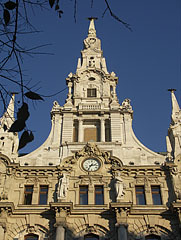 The four statues were resculpted by Sándor Boldogfai Farkas, Ödön Metky and János Sóváry in 1957. 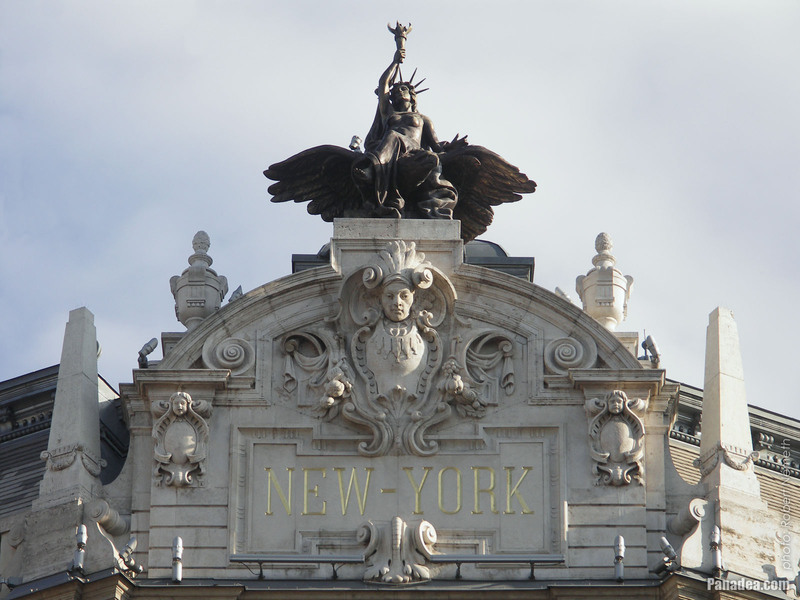 On the top of the corner of the New York Palace the statue is called "Genius of Liberty"
The statue has some similar motifs as the Statue of Liberty in New York (e.g. 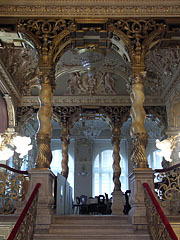 The torch and the typical crown). 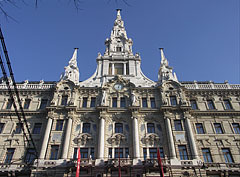 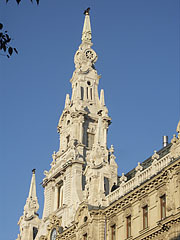 It was created by Károly Senyei Hungarian sculptor. These four ages are of course the Prehistory, the Antiquity, the Middle Ages and the Modern Era. 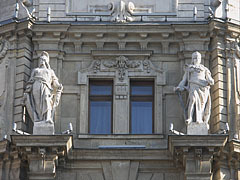 Originally all these statues were created by Károly Senyei, but in 1957 two of them had to be resculpted.